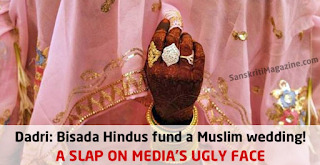 Rightwing Rumblings: Dadri : Hindus fund Muslim wedding. A tight slap on Media's communal face. 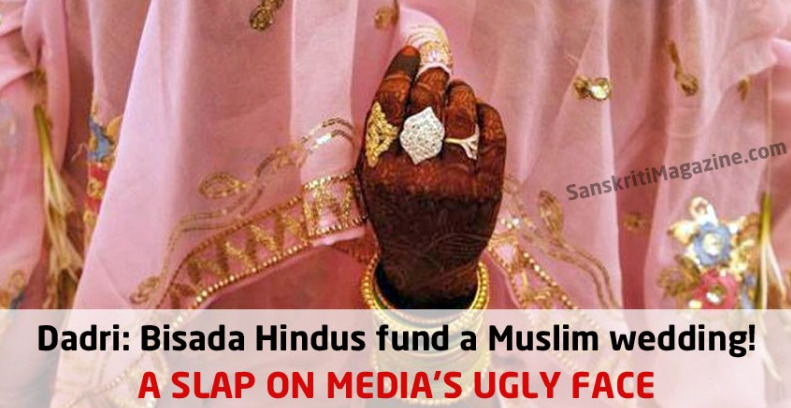 Dadri : Hindus fund Muslim wedding. A tight slap on Media's communal face. #‎Dadri‬: The entire village dominated by Hindu's voluntarily contributing towards the expenditure of the wedding which will be attended by nearly 1200 people in an attempt to showcase that nothing has changed. The family of two Muslim sisters had decided to conduct marriage ceremony outside the village , thinking that their in-laws will not come to the village after the incident , but Hindu elders of the village convinced the family not to shift the venue. Members of Hindu community even went to the grooms house to convince them to come to the village and continue the wedding ceremony as per scheduled date. The two daughter of Hakeem , a Muslim villager got married on sunday. The family of Mohammad Aklaq who was lynched , maintained their statement on living in the village peacefully and with out any communal strife for years.